The NTF Youth Cross Country is open to boys and girls from 8 to 18 years old interested in distance running. It can be a great way to stay active and fit over the fall season regardless your athletic specialization. The program is all-inclusive and welcomes both beginners and experienced athletes. This year the practice will start August 20th. On weekdays we will meet in Tudek Memorial Park; on Sunday afternoons, we go to explore some running routes in other parks and locations around town. 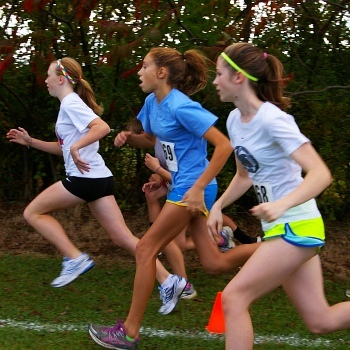 There are a number of youth cross country meets that our club participates in. As the season goes, we will build several age-group teams for traveling to the USATF Youth Cross Country Championships in November. Q: Would this program be suitable for my children who play sports, but have no experience in distance running? A: Yes, it would. No prior experience is required to join the club. The kids get that experience step by step as they go through the program, and in the end they really start thinking of themselves as runners. Besides running, this program includes a lot of core fitness and agility training as well as many fun activities. Q: What activities does a typical practice include? A: We normally start with ~5 min easy jog for a warmup, some stretches and agility drills. After that, we either go on a group run or do a workout. In the end, we play running games, do some core exercises, and finish with another set of stretches. The length of runs and intensity of workouts progress gradually through the season. Q: How long are the runs? Will my child be able to endure them? A: Coaches gauge the ability of athletes attending and form several groups. The beginner group may go for 10-15 at first at an easy pace. More advanced group may run for 25-30 min. We include walking breaks and develop necessary endurance gradually - nobody has to go over limits. Our regular group runs are done on trail loops within the Tudek Park. We have coaches running in the front and in the back of the pack to make sure no one is left behind. Q: How big is the group and what ages do usually participate? A: Usually, the fall program gathers 50-60 kids (approximately equal boys and girls) of various ages, with majority being 5-8 graders. At practice we warm-up together and may split into groups for runs or workouts. Q: How many days per week do you have practice? 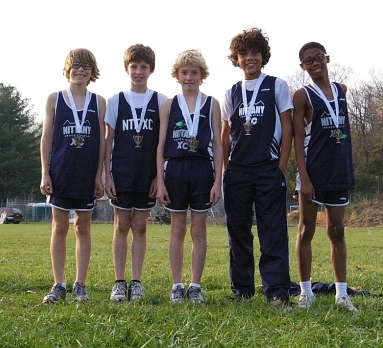 A: During cross country season we typically hold practice 5 times a week - Monday through Thursday and on Sunday afternoons, when we run in local parks around State College. Different coaches may be in charge of practice on different days. Q: Is attendance on all days mandatory? A: No. It is quite common that the kids are involved in many different activities in the fall, so feel flexible and choose the days that fit best into your schedule. Q: How many days is preferable to be at practice? A: It depends on your goals. If you want to see progress in endurance, fitness, get faster, or if you have competitive goals, at least 3 practices per week are recommended. Athletes who choose to be on the travel squads for USATF Junior Olympics should try to commit for 3 practices per week. If you are not there yet - just want to try it, hang out, and do it just for fun - even 1-2 days would be fine. Q: Can we try it out before deciding to join? A: Yes - everyone is allowed to join the practice and check it out for a week or so. Please fill out the waiver form, but you can hold the fee payment until you are sure that your kids want to stay in the club. A: Yes - parents are welcome to stay for practice (especially if they accompany young kids who are trying it), and participate in our runs and workouts. If you plan coming regularly and can help coaching, please inform Coach Mark who coordinates volunteer schedule. Q: Is it possible to sign up later in the season after the soccer practice is over? A: There is no restriction or deadline, so join any time. But it would be better to mail the registration form earlier to be on the e-mail list and to ensure that we order a shirt for your athlete. Q: Are there any cross country meets and how do we sign up for those? A: There are a few local all-comers meets, which are run in September-October. The Junior Olympic Mid-Atlantic and Regional meets are in November, and those are travel meets. Information on meets and races will be sent by e-mail to all club members and posted on the Club's website. For the local all-comers meets, you can sign up on the race day. For the Junior Olympic meets, there is on-line registration that should be done in advance through the Club. NTF pays all athletes meet registration fees. Q: What distances do athletes run at the meets? 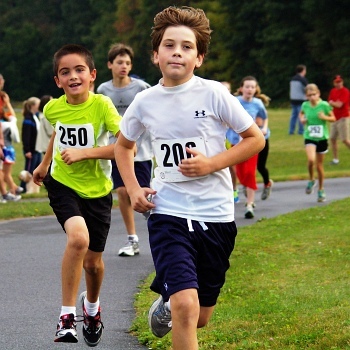 A: The youngest group 8 and under run 2k (1.25 mile), 9-10 and 11-12 groups run 3k (1.75 mile), 13-14 athletes run 4 k (2.5 mile), and older athletes run 5k (3.1 mile), the same as high school. Q: Is participation in meets mandatory? A: Not at all. Although we always encourage our athletes to try competition, there is no pressure about this matter, especially if this is the first year of them participating in cross country. It is up to parents and athletes themselves to decide when they are ready to race. Every year, there are quite a few competitive kids on the team who train for racing goals and represent NTF at the Regional and National meets. Q: What is required for joining the Club's travel teams for Junior Olympics? A: Each team will include 5 to 8 runners from the same age/gender category. Anyone who is ready to commit to training and travel to the meet can join - it does not depend on your running times or ability. Every runner is valuable. Quite a few first-timers participated in such teams last year and got great experience! Q: What should athletes wear or bring to practice? Q: Does practice get canceled because of rain (or snow)? A: Light rain is usually not a problem. As cross country runners, we dress accordingly and run through it. In case of strong, cold or freezing rain, or thunder, the practice may be cancelled. Then, a notification will be sent to all participants via e-mail before 5 pm.